The Senate pre-selection contest between Lee Rhiannon and Mehreen Faruqi in the NSW Greens is not your usual contest—anything but. The assault by the federal leadership of The Greens and the right-wing of the NSW branch on Lee Rhiannon has turned the pre-selection into a vote that will determine the future of the party as a party of protest. It is now obvious that the right-wing of the NSW Greens will support NSW MP Mehreen Faruqi as their best chance to remove left-winger Lee Rhiannon and decisively shift the party to the right. The right-wing of The Greens has waged a vicious campaign against Lee Rhiannon in the aftermath of her opposition to dealing with Malcolm Turnbull over his Gonski 2.0 schools funding plan. She was excluded from the Greens federal party room in June, while hostile sources inside the party attempted to discredit her through the media. Right-wing NSW Greens MP Jeremy Buckingham labelled Rhiannon and “her faction” as enemies of party democracy. But in reality he is the one who scorns party democracy, openly ignoring decisions of the State Delegates Councils (SDC) whenever they don’t align with his own conservative views. For instance Buckingham maintains his membership of the “Parliamentary Friends of Israel” despite the NSW Greens’ strong support for the Palestine solidarity campaign. For some months Faruqi had been promoted as a “compromise candidate” that both left and right could support to provide a smooth transition from Rhiannon. But the political challenge to Rhiannon from the right has changed what is at stake in this vote. Although pre-selection rules have been ratified and campaigning is well underway nominations do not formally close until October. So far, the right has not nominated its own candidate. Faruqi is already being promoted by the right through a series of public appearances alongside right-wing MPs and invitations to speak at right-aligned local groups. It was such local groups that were the bedrock of support for previous right-wing pre-selection candidates like Justin Field and Dawn Walker. The Byron Greens group hosted Faruqi to speak at a special dinner in Mullumbimby in June. More recently, Faruqi visited the Central West Greens branch, controlled by supporters of right-wing MP Jeremy Buckingham and hostile to Lee Rhiannon and left-wing NSW MP David Shoebridge. Faruqi also appeared with Jeremy Buckingham and Dawn Walker at the launch of the Ryde-Epping Greens council election campaign and visited Ballina Greens, with NSW MPs Dawn Walker and Tamara Smith, in the heartland of the conservative faction. 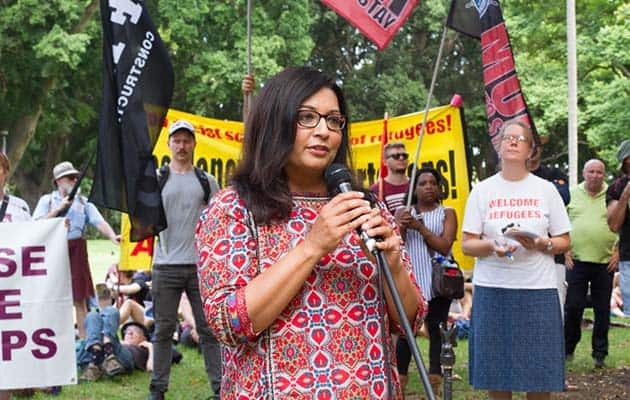 Faruqi herself is not a right-winger and has a strong history of anti-racist advocacy as well as support for grassroots democracy in the NSW party. She was not part of the right-aligned bloc of four NSW Greens MPs. It is likely she will indicate her respect for the NSW Greens’ democratic structures, including decisions of the SDC. But in the context of the internal offensive against Lee Rhiannon, part of a concerted right-wing push to consolidate The Greens as a party of parliamentary pragmatism, a defeat for Lee Rhiannon would be a serious blow for the left. The looming struggle will be crucial in determining The Greens’ future. Federal leader Richard Di Natale and his supporters primarily want the party to win seats by playing parliamentary games and cutting deals, even with the Liberals, to promote the party as able to “get outcomes”. Rhiannon and her supporters want a party more closely connected to trade unions and social movements, and would have The Greens stand clearly against the political establishment. In recent years, the right faction in NSW has been better organised and gaining ground. They have already won the last two pre-selections in NSW, indicating both an effective apparatus and a certain level of support in the membership. The left need to call meetings to mobilise and cohere the support for Rhiannon, using issues like her principled stance on Gonski 2.0 to draw teacher unionists and others into the campaign. That support can be channeled into arguing for a party that raises working class demands, that orients to the trade unions, champions social movements as the basis of change and doesn’t shy away from anti-capitalist politics. The rise of Jeremy Corbyn and Bernie Sanders shows there is a huge appetite for this kind of politics.